Savour juicy North Atlantic prawns with a rich Bloody Mary Marie Rose sauce. The vanilla seeds are a magical touch - lifting the dish to the sublime. Serve with crisp shredded lettuce and ripe tomatoes for a fabulous starter. 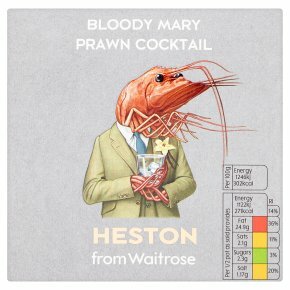 INGREDIENTS: Prawns (Pandalus borealis)(crustaceans) (55%), rapeseed oil, tomato ketchup (4%) (tomatoes, spirit vinegar, sugar, salt, spice and herb extracts [celery], spices), pasteurised free range egg yolk, water, sugar, vodka, spirit vinegar, Worcester sauce (water, sugar, spirit vinegar, molasses, onion purée, salt, tamarind paste, cloves, ginger purée, garlic purée), cornflour, salt, tomato paste, concentrated lemon juice, mustard flour, tomato powder, vanilla seeds, fortified wheat flour (wheat flour, calcium carbonate, iron, niacin, thiamin), ground celery seeds, ground cloves.